The United Nations General Assembly passes Resolution 181 by a vote of 33-13 with 10 abstentions. The Resolution recommended the creation of separate Arab and Jewish states in Palestine, linked by an economic union. This vote to partition Palestine gave the pioneers of the Zionist nation international legitimacy to establish a state, which came to fruition on May 14, 1948. Facing increasing violence in Palestine, as well as deteriorating relations with the Zionists, the British turned to the newly created United Nations for help. In April 1947, the UN set up the UNSCOP (United Nations Special Committee on Palestine). Its purpose was to investigate the underlying causes for the persistent communal unrest and to make political recommendations about next steps. The UNSCOP committee included eleven nations: Australia, Canada, Czechoslovakia, Guatemala, India, Iran, Netherlands, Peru, Sweden, Uruguay, and Yugoslavia. In September, UNSCOP issued recommendations where a majority suggested a partition plan and a minority report suggested a federal solution of two communities living in one state. 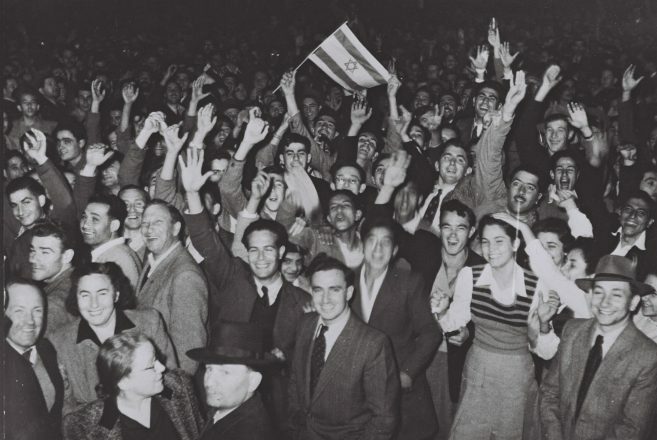 Before the UN General Assembly adjourned on November 29, it appointed a five member commission to implement the partition plan. The commission proved useless, thus adding to the growing chaos in Palestine, whereupon, Britain withdrew its civilian administration in May 1948.